« SQL Server 2008 Management Studio (SSMS) displaying incorrect build number? A few weeks back I upgraded a SSIS 2005 package to SSIS 2008 and ran into a issue with my Data Flow Task source. In the original package I was using a DataReader source to query information from Analysis Services (SSAS) and during the upgrade this gets converted to a ADO NET source in SSIS 2008. The reason I was using a DataReader with an ADO.NET connection manager was because you could get around the annoying about being unable to map external data properly and that it will use the DT_WSTR data type when you try to preview the results of your query for the data source. I did a blog posting last year Using Reporting Services (SSRS) with SSAS data where I went through some different options of getting SSAS data into a format to easily use with SSRS. This is when I basically decided that I would use the DataReader over the OLE DB source when using SSAS. Also, if you use the OLE DB data source and have the Data Flow Task embedded in a Loop container this could cause some issues depending on the connection manager setting (more on this later). [ADO NET Source ] Error: SSIS Error Code DTS_E_INDUCEDTRANSFORMFAILUREONERROR. The "component "ADO NET Source" (43)" failed because error code 0x80004002 occurred, and the error row disposition on "output column "[Measures]. [Reseller Sales Amount]" (67)" specifies failure on error. An error occurred on the specified object of the specified component. There may be error messages posted before this with more information about the failure. 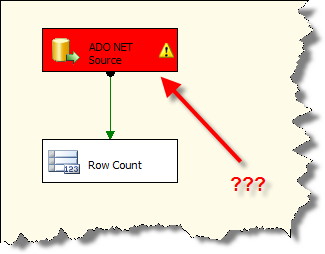 [ADO NET Source ] Error: The component "ADO NET Source" (43) was unable to process the data. Pipeline component has returned HRESULT error code 0xC0209029 from a method call. [SSIS.Pipeline] Error: SSIS Error Code DTS_E_PRIMEOUTPUTFAILED. The PrimeOutput method on component "ADO NET Source" (43) returned error code 0xC02090F5. The component returned a failure code when the pipeline engine called PrimeOutput(). The meaning of the failure code is defined by the component, but the error is fatal and the pipeline stopped executing. There may be error messages posted before this with more information about the failure. 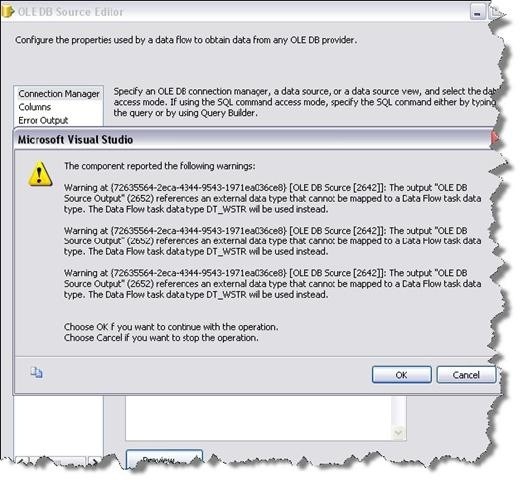 [SSAS OLEDB Cube Source ] Error: SSIS Error Code DTS_E_OLEDBERROR. An OLE DB error has occurred. Error code: 0x80040E05. An OLE DB record is available. Source: "Microsoft OLE DB Provider for Analysis Services 2008." Hresult: 0x00000001 Description: "Error Code = 0x80040E05, External Code = 0x00000000:.". [SSIS.Pipeline] Error: component "SSAS OLEDB Cube Source" (928) failed the pre-execute phase and returned error code 0xC0202009. Once you have verified the connection manager property and have this added to the Control Flow the package will run fine. Still get the annoying warning messages when trying to preview and work with the OLE DB source, but at least the package runs. This entry was posted on March 29, 2009 at 12:56 pm	and is filed under Integration Services. Tagged: ssas, ssis. You can follow any responses to this entry through the RSS 2.0 feed. You can leave a response, or trackback from your own site. Good article but the last paragraph about the ADO NET source SqlCommand property was was icing on the cake for me. I have been looking all over for that info. Thank again. I agree, they could have made this setup just like the OLE DB source. That would have been nice. Sometimes you just have to step back a bit and in this case a tab to see what the other possibilites and options are. That is one reason I like SSIS so much is that it is so flexible and you can quickly find alternatives and implement them to meet your needs. The way I got around this was by using a script transformation as a source. This way you get around issues with SSIS validating what you are doing (and subsequently erroring) and you don’t need to add in the wait step. An OLE DB record is available. Source: “Microsoft OLE DB Provider for Analysis Services 2008.” Hresult: 0×00000001 Description: “Error Code = 0x80040E05, External Code = 0×00000000:.”. RetainSameConnection property is set to false already. In MSDN, Arthur recommended to use SP4 but before going that I want to see other options/opinions – http://social.msdn.microsoft.com/Forums/en/sqlintegrationservices/thread/99229e33-2fb7-43da-84b2-dd54daf04d05. Do you have a loop setup in your task as well or is the DFT just being called once? If you do have a loop where this is being called repeatedly or maybe back-to-back DFT in the control flow then I would try adding a pause (wait script) inbetween each one to see if you get better consistency that way and try running the package multiple times to see if this resolves your issue. No, there isn’t any loop in my package, however, it basically has 2 conditional branches among which only 1 executes at a time. In each branch there are 2 DFTs. One of the DFT has MDX which takes more than 5 minutes to execute and rest has MDX whose execution time is less than a minute. I also noticed that my package takes double the time of total MDX execution time, due to validation, is there any way to avoid this validation each time and reduce the time by half? As per your suggestion, I probably would add a delay script in between the 2 DFTs or may be get rid of the second DFT to check if it works. I would like to ask you a question: I’m working on my thesis about Data Warehousing. I’ve built up a warehouse and also OLAP cubes using Business Intelligence Development Studio. Now I must make a C# tool for querying the cubes, and I read about ADO NET, but I couldn’t find any reference about it’s usage with Microsoft SQL Server 2008. Can you tell me what .dll do I have to use? Is it the same as in the case of MsSQL Server 2005?